Living Dead Dolls Series 20 Twenty Living Dead Dolls Day of the Dead El Día de los Muertos at WackyStacker.com of Horror & Laughs! 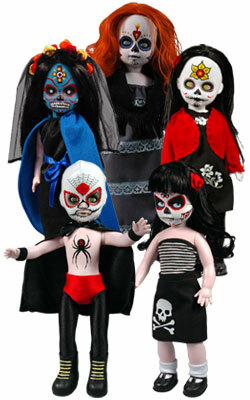 Day Of The Dead In the spirit of Halloween, Mezco’s latest set of Living Dead Dolls pays tribute to the skeleton filled holiday known as The Day of the Dead or El Día de los Muertos. 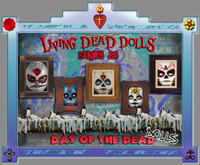 The series features intricate skull designs and elaborate costumes, depicting traditional imagery with a Living Dead Dolls twist.